We can define Method Overloading as , Same Methods name with different type of parameter or different set of parameters. Web method overloading is not straight forward in use. Suppose there are 2 methods in a web service. This code will compile successfully but will give error at runtime. Please look at below screen shot. You just need to add message to both of the method to identify. 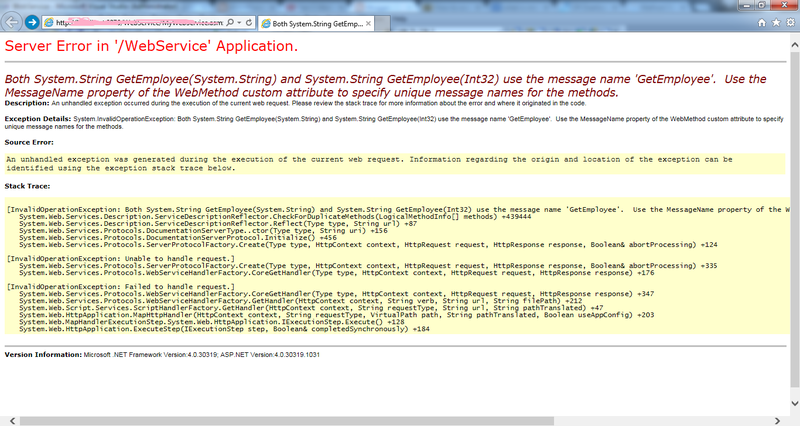 [WebServiceBinding(ConformsTo = WsiProfiles.None)] from top of the page in service code behind.